Sequel to one of the most successful arcade racing series ever made. High Definition Graphics from the most powerful arcade game board - Europa-R. 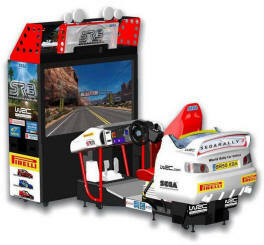 Brand new cabinet design – Fantastic motion simulation that gives you the feeling of being on a real rally stage. Unique track deformation, never the same race twice! Enjoy Tropical, Canyon & Alpine back to back as players aim to complete all 3 tracks within the checkpoints times. ● Finishing a stage allows automatic progression to the next stage. ● Players who fail to complete the stage will be able to insert another credit to retry that stage from the beginning, enhancing the cashbox potential. ● By finishing 1st overall in Championship players will unlock a head to head race on the secret Lakeside track. ● 1 – 6 Player. ● Choose from 6 licensed WRC cars. ● Two secret hidden cars to be discovered. ● Three challenging environments to choose from, all varying in difficulty. From the fast, easy corners of Tropical to the unforgiving hairpins of Alpine. ● Feel every bump, corner & crash with the motion simulation. ● Relive the original desert track from Sega Rally Championship ’95. ● Now remodelled in glorious High Definition. ● Experience those infamous jumps like never before with the new motion simulation. ● Race with the original, iconic cars; the Toyota Celica ST205 or the Lancia Super Delta HF Integrale. ● Race head to head against your friend or the computer. Or for the first time ever race against up to 5 of your friends!